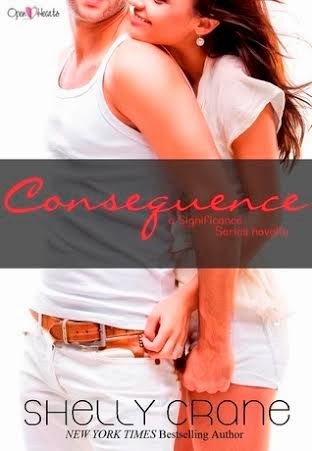 Kayla's Place: Open Heart Chronicles Blog Tour - Consequence by Shelly Crane!! Open Heart Chronicles Blog Tour - Consequence by Shelly Crane!! Maggie and Caleb are married, leaders of their people, parents to their children, and happier than they ever dreamed, even with the visions they saw of it to prove it so. The council is still rebelling against Maggie’s changes, but this time it’s different. It’s almost as if something…or someone is behind them, pulling the strings and making decisions for them. And Maggie is having strange visions that only she can see, leaving Caleb helpless to help her. But when her visions start to warn her that their daughter, Ava, will one day be in danger, they’ll do anything it takes to find out what’s going on and how to stop it, even paying a visit to a previous Visionary. Maggie and Caleb must find out who or what is behind it all and stop them before Maggie is one vision too late. "Hi! Thanks for letting Caleb and I stop by your place today. We're in a hurry - you know, Visionary Champion business and all, but I told Caleb we absolutely had to make time and stop by today to say thank you for helping with the release of Mrs.Crane's new Significance book. Right, baby?" Caleb gives Maggie an adoring look. "Of course, baby." Maggie smiles and nudges him arm. "Don't make me all swoony , Jacobson." Caleb chuckles and puts his arm around her shoulder, bringing her close and kissing her temple. "I'll behave if you will," he says low. He looks up at the blogger whose stunned and waiting patiently. "Go ahead and ask whatever you like." Most romantic gesture you've done for each other? Maggie: I'd have to say when he went to so much trouble to secretly replace the star bracelet. He's done a ton of amazing things, but knowing how much that meant to me and trying to surprise me was super sweet. Caleb: The wedding vows she wrote for me and the way she wrote them. Hands down. Favorite qualities about one another? Maggie: I love how he always thinks about me - about how I'll react or what I'll want or think about things. His being so considerate is my favorite thing. Caleb: Maggie is amazing. She goes with the flow and is such a good person without even trying to be. And she's an amazing mother. That's two things, but oh well. Let's be honest now...most annoying trait about each other? Caleb: *laughs loudly* She puts the empty milk carton back in the fridge. Every time. Maggie: *nudges his gut with her elbow* He leaves wet towels on the bedroom floor. Maggie: *laughs* Oh, yes you do, Jacobson. Caleb: *chuckles and kisses her forehead* Whatever you say, boss. Do you have pet names? If so what are they? Caleb: Jacobson. It's pretty hot. Maggie: He calls me any and every endearment and they all make me melt. Baby is probably my favorite. But I also just love hearing my name come out of his mouth. Caleb: *smiles a real smile* I knew that. Ideal Valentine's Day date and/or gift? Maggie and Caleb answer together: The beach. Caleb: *laughs* If we could go and hang out at the beach all day and surf or just lay around, and then spend the night at the beach house together? That's a perfect day. Maggie: Yeah, what he said. I'm still not that great at surfing, but it's fun having him teach me. Caleb: And I love taking Maggie to new places to eat. She's open to trying to new things. I love that. Maggie: I love letting you pick new foods for me. You do a good job. What is the simple most important thing in a relationship to be happy? Is there anything that you'd change if you could go back and do it all over again? Caleb: *Looks at Maggie and shakes his head, bringing her wrist up to kiss her tattoo* Not. One. Single. Thing. Maggie: *Bites her lip and looks at him* Never. Okay, last question. Should fans of the Significance books read the new spin-off series with your daughter, Ava, that comes out this fall, Undeniably Chosen? Maggie: Totally. Caleb and I will be in it a lot and if you're a fan of the new love feel of a book - when people first get together all that entails - you'll get plenty of that. Ava is a strong girl, but she's got a lot of rough stuff ahead for her. But there's a lot of good ahead of her, too. Use the rafflecopter form below for the awesome tour wide giveaway! Good luck everyone! Share book reviews and ratings with Kayla, and even join a book club on Goodreads.